Renovating a kitchen is never cheap. The average national cost to update a 200-square-foot kitchen, including installing new flooring, semi-custom wood cabinets and standard appliances, is roughly $62,000.00, according to Remodeling magazine, which tracks the cost of home improvement projects annually. Adding luxuries like stone countertops, a built-in refrigerator, a commercial-grade cook-top, designer faucets and top-of-the-line custom cabinets can bring the cost six figures, on average. For cabinet fronts made of material that cannot be painted or stained, consider refacing, also known as resurfacing, which involves keeping the existing cabinet framework and replacing all the doors, drawer fronts and side panels with new ones. The cost for all new cabinets would run in the $20,000 range vs. the refacing cost of about $2,500. Work with what you have. Create an accent wall to add depth and contrast. Add rollout shelves, a new range hood and modern light pendants for functionality, design and elegance. If your cabinets are too far gone to reface, open shelving will reduce the cost of upper cabinetry. With this method, you are only paying for the piece of wood to make the shelf and the bracket to hold it up — not an entire cabinet box, which is a lot more in material and labor. It also eliminates the need for hardware, which can quickly add up. Another way to reduce the cost of cabinetry is to use particleboard where no one will see it. Having all-plywood kitchen cabinetry, although sought after as required, your cabientry does not have to be made full of plywood. While plywood should be used under the sink (in case of a leak), using particleboard to build out the upper and perimeter cabinet boxes is a way of saving $1,000 , if not more depending on the size of your kitchen. Look at it as not only a money saver, but as a possible stress reliever! It can be pretty easy to do over a weekend with a friend or spouse. First and foremost, you will want to switch off your circuit breakers, water and gas. Remove appliances and plumbing fixtures first, followed by cabinets, backsplash and counters. For a clean-looking countertop on the cheap, nothing beats butcher block. You can get one for as little as $99 at Ikea, which sells precut butcher-block counters in standard sizes. Butcher block brings warmth to an otherwise sterile kitchen and has a number of practical applications. Look at it as having a built-in cutting board throughout your kitchen. Keep in mind that there is some maintenance involved in keeping butcher-block counters looking new: They need to be sanded and oiled regularly — typically twice a year. Moving walls, electrical and plumbing is where you will see your costs significantly increase. But while you’ll save by keeping those components in place, you shouldn’t skimp on functionality. If moving that corner sink will improve the flow of your kitchen, don’t hesitate to adjust the layout. Or find an alternative that solves the problem. Making one design decision leads to what seems like a million other to-dos; take tile for instance. What color tile? What size tile? What pattern? – The same applies when it comes to your staircase. This goes beyond the style of the steps, the risers or the banister. The first thing you’ll need to consider is the actual shape of the staircase. Here are several popular types of stairs; bring your favorites to your architect and contractor to discuss what makes the most sense for your home. This one is straightforward, literally. Straight stairs feature a single linear flight with no change in direction. The classic straight style, zhuzhed up a little. In this design, the stairs make a 90-degree turn at some point, going left or right after a landing. If you’ve ever promised yourself you’d take the stairs every day at your office, you’ve seen this back-to-basics style. The bend is taken even further to form a full U shape, and similar to the L-shaped staircase, a landing separates the two parallel flights. The slightly more complicated sister to the L-shaped staircase. A set of winders—treads that are wider on one side than the other—takes the place of the landing to save space. Marble countertops are timeless, refined and luxurious. But budget-friendly? Not really. That is until you employ this genius design trick. The strategy: Fake the thickness of any countertop so it looks a hefty three inches tall, but is, in fact, just 3/4 of an inch. The look of a thick, substantial stone top is well sought after but it can often be cost-prohibitive. This is an elegant solution to achieve a chic look while on a budget. We’re not talking penny savings here – we’re talking cutting the cost of your countertop in half ! Depending on the size of the surface, you could potentially save up to 40-50% on material costs. The execution: Once you have your marble slab selected, your contractor will begin with measurements. If the space calls for a 24-inch countertop, your contractor will add a couple extra inches of width to achieve the subjected “trick-of-the-trade.” Your contractor will template your countertop to have a “mitered” edge (or mitered book-matched edge). A mitered edge adds more stone to the underside of a countertop slab creating a distinguished look through the illusion of a thicker slab. DO you speak your mind? – Open and clear communication is the single most important aspect to building a good relationship with your contractor. This starts at the very beginning of the project and includes a signed contract, and agreed-upon timeline and budget. Establish other ground rules up front so issues don’t crop up later. And be sure to voice any questions you have, no matter how silly they sound. Don’t make any assumptions. DO establish a point person – Everyone involved in a renovation has thoughts and ideas. It is important and recommended that one member of the household works directly with the contractor. Compile thoughts/ideas throughout the day and whether you have daily or weekly site meetings with your contractor; bring these ideas into action then. This keeps for a steadier and smoother project. DO have a plan if you’re not on site – The complexity and length of the project and how long you’ve known your contractor can determine whether or not to be home. For convenience, some homeowners will provide a key or pass code so the contractor can work without interruption. However, you shouldn’t do anything that you’re not 100 percent comfortable with. DON’T leave out fragile valuables – Take the time to relocate your valuables from the main work areas. If you have a spare room that is not included in your renovation you can relocate your items here. If you are taking on a full gut renovation, we recommend an outside storage unit. This takes stress off of you being concerned with your belongings and stress off your contractor to not damage. DON’T let kids & pets run free in the work area – Safety is first for both the job crew and for your family. Something involving an addition or whole-home remodeling may require that the family relocate during the construction process. 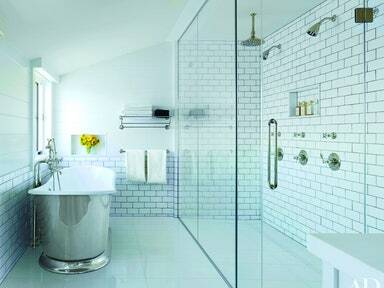 7 Subway Tile patterns you’ve never thought of.. Subway tile in its original form—uniform stacks of tile laid horizontally and off-center—is as classic as it gets. But just like a white shirt, there are endless ways to reinvent it. Sure, there’s the color of the ceramic or grout color to play with, but it’s really as easy as rearranging the pieces à la Tetris. Turn the tiles on their sides, group them in pairs, place them so they follow the lines of the wall and ceiling. In an unexpected pattern—check out some of the genius ideas below—the material feels decidedly fresh and exciting.